Accessory vendor Mophie has announced the Juice Pack - iPod touch 2nd Gen, a combination case and battery for the second-generation (2G) iPod touch. The JuicePack slides onto a 2G iPod touch like a protective case (though leaving the front and part of the sides of the iPod exposed) and connects to the iPod's dock-connector port. According to Mophie, the built-in lithium polymer battery double's the iPod's standard battery life, offering up to 42 hours or audio playback or seven hours of video; your iPod draws power from the JuicePack's battery first, using its own battery only after the JuicePack's power is depleted. A USB port on the bottom of the case lets you connect your iPod to your computer for charging and syncing without having to remove the iPod from the case; the necessary USB cable is included. LED indicators on the JuicePack display the remaining battery life or charging time. The case's outer surface is covered in a non-slip, rubberized finish. 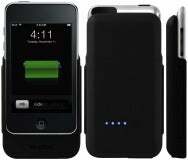 The $100 JuicePack is available now from Mophie's Web site and in retail stores.